The Bahamas is moving toward greater participation in the world trading system at both the regional and international levels. In fact, the nation is positioned to become a full World Trade Organisation (WTO) member by 2020 and since 2008 has been a signatory to the EU-CARIFORUM Economic Partnership Agreement (EPA). Membership in both trading regimes, if maximized, has the ability to grow and diversify the Bahamian economy. It is against this backdrop that the Bahamas Chamber of Commerce and Employer’s Confederation (BCCEC) will spearhead a series of international Trade Missions in 2019 in order to seek opportunities in export (both goods and services) and investment for the private sector. In many instances, the missions are being organized in conjunction with the Bahamian public sector. The 2019 schedule proposes visits to four countries throughout the North American, Asian, and the Caribbean and Latin American regions. A Nassau based International Trade Expo will also be organized, primarily, for Bahamian businesses to showcase their products and services. The missions will generally take place within a one week period and participants will learn about doing business in the host market and gain exposure to the social and business cultures. If you are part of the Bahamian business community, contribute to The Bahamas’ economic growth, have a demonstrated capacity for internationalization, and have good potential to add value to the Bahamian economy, you can participate in a Trade Mission. Generally, interested companies must register for a specific trade mission and will be screened for suitability based on the objectives of the mission. 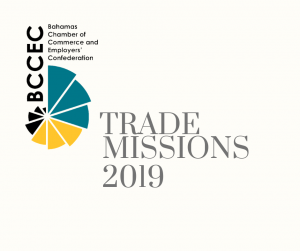 Download the Trade Missions Schedule for 2019 for more details and/or contact the BCCEC at 322-2145 for more information. Click here to register.